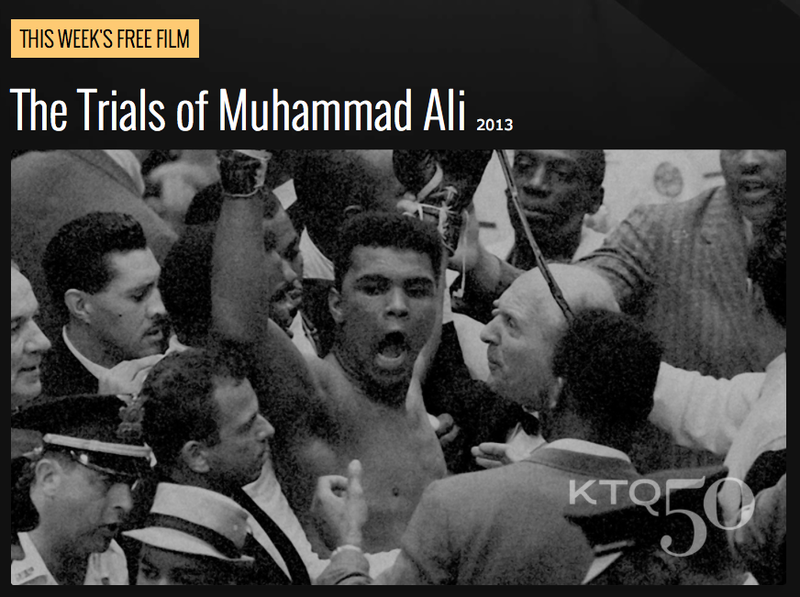 From today until Friday, September 23rd, the free KTQ50 film is the Emmy Award-winning The Trials of Muhammad Ali (2013). "Bill Siegel’s audacious documentary puts new heat and focus on what an extraordinary figure Muhammad Ali was outside the boxing ring. No film has probed this deeply into the fallout from his name change or his complex bond with Malcolm X and the Nation of Islam. And the saga of Ali’s refusal to be drafted during Vietnam becomes a profile in courage — a tale of shocking vilification and faith lost and found." World premiered at the 2013 Tribeca Film Festival, The Trials of Muhammad Ali delves deeply into a time when an emerging sports superhero chooses faith and conscience over fame and fortune. The fury he faced from an American public enraged by his opposition to the Vietnam War and unwilling to accept his conversion to Islam, has global implications for generations now coming of age amidst contemporary fissures involving freedom, faith and military conflict. Archival scenes highlight the life forces who support and oppose him, including his spiritual mentors, Malcolm X and Elijah Muhammad, and critics of his stance, such as Jackie Robinson and Joe Louis. Interviews shot exclusively for the film feature those who were there: his brother, Rahaman; his bride, Khalilah Camacho-Ali; New York Times writer, Robert Lipsyte; and Nation of Islam leader, Louis Farrakhan. What emerges is the hidden history of Muhammad Ali, an opportunity for audiences worldwide to discover how his journey - toward a full spiritual embrace of Islam and through his humanitarian work around the world - challenges us to overcome today’s fissures of race, faith and identity. The film was directed by Bill Siegel (The Weather Underground), produced by Rachel Pikelny, edited by Aaron Wickenden, and executive produced by Justine Nagan and Gordon Quinn for Kartemquin Films, Kat White (KatLei Productions), and Leon Gast (When We Were Kings). The Trials of Muhammad Ali was distributed in theaters by Kino Lorber and aired on PBS Independent Lens to wide acclaim. Watch the G.O.A.T. is his toughest fight today to understand, learn and remember why he is one of the most important figures of the late twentieth century. The Trials of Muhammad Ali is available for purchase on DVD here.